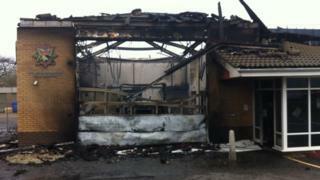 A Norfolk fire station gutted in a blaze that destroyed a fire engine had no sprinkler system, a senior officer reveals. Norfolk's deputy chief fire officer Roy Harold said the service should have followed its own advice. Police officers working nearby reported the fire in Downham Market just after midnight. It started in the bay where the station's engine, costing up to £250,000 to replace, was destroyed. Mr Harold said: "Normally we go to other people's fires, but tonight we had to go to our own. "I think there is a fire safety message there for us. This building's relatively new, but it wasn't sprinklered. "If it'd been fitted with sprinklers, we wouldn't be here today chatting about this because the fire would've been put out very, very quickly automatically. "We now ask all new building developments to consider sprinklers very strongly." Nearby houses were evacuated for a short time. No-one was hurt. At the time, there was no-one was at the station, which is retained. New equipment and a replacement fire engine have already been delivered to the town, stationed at the nearby police station. "We've lost the fire station but we haven't lost the cover," said Mr Harold. A new fire station could cost about £1.5m, he said. Watch manager Kim Scotney said: "The rest of the crew are dumbfounded. It hasn't quite sunk in properly, but at the end of the day nobody was hurt." Norfolk's chief fire officer, Nigel Williams thanked police for their help. "In the future, we will be looking into the potential to sit down with colleagues from Norfolk Constabulary and discuss future arrangements which may be eligible for some sort of funding from central government," he said. An investigation into the cause of the fire will begin when the building has been declared safe. Downham Market fire station has one watch manager, two crew managers and eight firefighters. It has been on its present site since 2006.